The Asia-Pacific region is emerging as a "global powerhouse" - J.D. Power says - and Chinese sales could grow to 15.6 million units in 2010, 3 million more than the United States, the market research firm said in a forecast released today. China is expected to fortify its position as the world's biggest automotive market in 2010 after moving to the top spot in 2009, J.D. Power and Associates said in a new forecast released today. “The center of the automotive universe is shifting quite rapidly away from the established markets of North America and Europe,” John Humphrey, J.D. Power's senior vice president of global automotive operations, said in a statement. Sales in the established markets “may be flagging,” according to the report. June sales have slowed in the United States, and the European market is uncertain. But Brazil, Russia, India and China are growing, said J.D. Power. 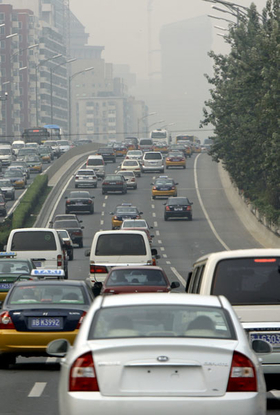 China will widen its lead as the world's biggest automotive market in the second half of 2010. But the growth in Chinese light vehicle sales has slowed to the lower double digits compared with 50 percent last year. • North American light-vehicle sales will increase 12 percent compared with 2009 to 14.2 million, a decline of 25 percent from 2007. • U.S. sales probably will rise 13 percent to 11.8 million vehicles in 2010. “Due to the increasing likelihood of a slower recovery,” sales could come in 200,000 lower than forecast. The seasonally adjusted rate improved year over year to 11.0 million in June, compared with 9.7 million vehicles a year earlier. • Mexico will show the largest gain in North America in 2010, up 14 percent to 860,000. That's still dramatically lower than Mexico's peak of 1.1 million units in 2007. • Sales in Canada have not suffered dramatically from the recession and will rise 5 percent to 1.53 million vehicles. • European sales are suffering from the expiration last year's scrappage incentive programs and the debt crisis in several countries. European sales will fall 5 percent to 17.2 million, with a drop of 20 percent in Germany, a decline of 7 percent in the United Kingdom and a drop of 5 percent in Italy. • Japanese sales will increase 11 percent to 5.0 million vehicles. Peak sales were 8 million units in 1990. “Sales in the region are forecast to grow 16 percent year over year to end 2010 at 27.9 million units. China is doing the heavy lifting, even though there are signs that growth in the China market is slowing slightly,” said Humphrey. • Chinese sales could grow to 15.6 million in 2010, 3 million more than the United States. • Brazil's sales will increase 8 percent to 3.3 million. • India will grow 19 percent to 2.5 million vehicles. • Russian sales are expected to increase to 1.6 million vehicles, compared with 1.5 million in 2009. J.D. Power also forecast that the global hybrid market will grow 25 percent in 2010 to 910,000 vehicles and to 2.3 million in 2015, representing 4 percent of total global vehicle sales. Worldwide sales of electric vehicles will double this year to 24,000 with the launch of the Nissan Leaf, Ford Transit Connect van and Chevrolet Volt. By 2015, global electric-vehicle sales will grow to 500,000 units.